Do you seek to express your digital voice? Join us & learn the craft of FIRST PERSON digital storytelling! 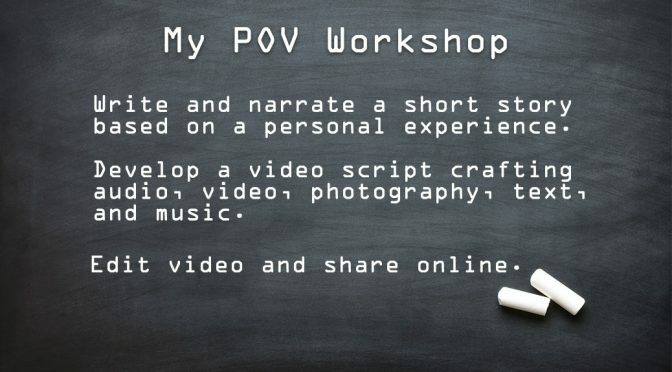 My POV workshops empower participants as digital storytellers to write, craft, and edit a digital story based on a personal experience. Workshop participants work with Media Artist to learn how to craft key story ingredients into a memorable video posted online. First we explore storytelling concepts, then write a short personal story, craft a video script, and then create a digital story through video editing. Story narrative written from first person point of view. Story narrated by storyteller through audio recording. Visuals & sounds, such as photography, video, music and sound effects are gathered and crafted into a video script. Video editing conducted by media artist and storyteller. Digital stories are posted online. Workshop participants learn key concepts within the multiple layers of digital storytelling. Workshop participants learn how to write a short first person narrative in a conversational spoken word style. Using video script writing techniques, workshop participants develop an audio visual narrative to accompany story narration. Workshop participants create and gather media assets and record story narration. Media Artist edits digital stories remotely and in collaboration with workshop participants.